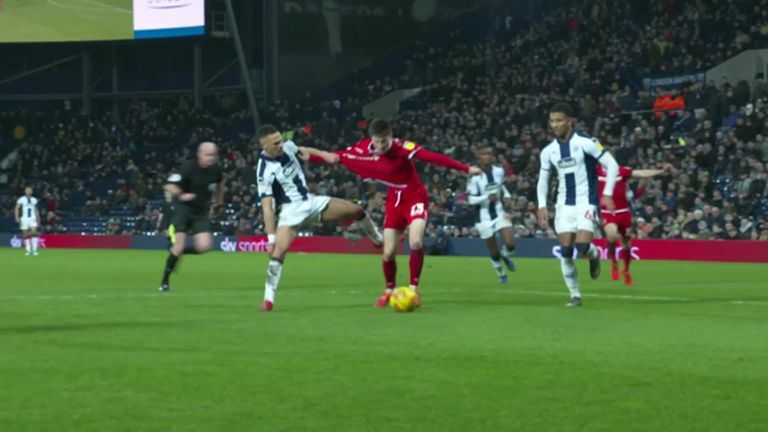 WATCH: Did Dwight Gayle dive to earn a point for West Brom against Nottingham Forest? There was late drama at The Hawthorns as Dwight Gayle appeared to win a penalty despite minimal contact from Alexander Milosevic. It was one of two contentious late issues in Tuesday's clash. First of all, having been 2-1 down heading into the final minute of the game, the Baggies were awarded a penalty after Dwight Gayle appeared to be tripped by Milosevic. Replays suggested there was little to no contact from the defender, yet Jay Rodriguez scored from the penalty spot to salvage a late draw for the hosts and keep their hopes of a top-two finish alive. Dwight Gayle won a penalty after a challenge from Alexander Milosevic. Speaking after the game, Sky Sports pundit Don Goodman said the awarding of the spot-kick had been harsh. He said: "I don't think there's any doubt that he (Gayle) has probably deceived the referee. I don't know what the ramifications are for Dwight Gayle and West Bromwich Albion, whether he'll get a ban. "He may argue that there's a tiny bit of contact, but it's so minimal we can barely see it and he's looking for it. Then there's the fall; Lee Mason has bought it and West Brom have a point that they really don't deserve, to be honest." Later, Kieran Gibbs was not penalised for a foul on Joe Lolley, despite having vigorously tugged the winger's shirt, and Goodman suggested Lolley's honesty did not serve him well in this particular situation. He added: "It's double-barrelled, isn't it? This is why Nottingham Forest will feel really aggrieved, because there's no doubt that Kieran Gibbs has got a massive fist full of shirt, but Joe Lolley stays on his feet and that right there is the reason players fall over. "They go down because it seems referees will not give you a penalty unless you go to ground and it's wrong. If you have a look at that, it appears Lee Mason is looking at the ground, looking at the ball. He's focused on the ball and therefore he's missed the shirt." WATCH: Pulse v Thunder LIVE!